Guess who's sick and tired and plans on crawling in bed and staying there forever and ever (or until tomorrow morning)? Yes, now that all the stress is gone, and I've had time to relax, it seems my antibodies have also decided to relax. But hey, it's almost the weekend and, most importantly, this didn't happen last week. Now that would've been a drag. Unfortunately there isn't much left in my fridge these days since I haven't yet gotten a hang of this whole buy groceries for one person only thing--during my LSAT nerd period I lived off steamed veggies, fruit, cereal and lots and lots of takeout. Anyways, here's something I had for dinner on Tuesday and lunch on Wednesday. Hooray for leftovers! It's an easy prep dish that taste delicious and can probably be adapted to include any and all of your favorite veggies. The original recipe called for carrots only, but I added some mushrooms, because I just couldn't stop myself. I'd love to try this with broccoli or cauliflower, since I'm sure they would soak up the marinade very well. Active time: 10 minutes. Total time: 40-45 minutes. **If adding more vegetables just make more marinade as necessary. Heat broiler and set rack about 4 inches from heat--unless you're using a broiler pan, then set rack so that the top of the pan is 4 inches from heat. 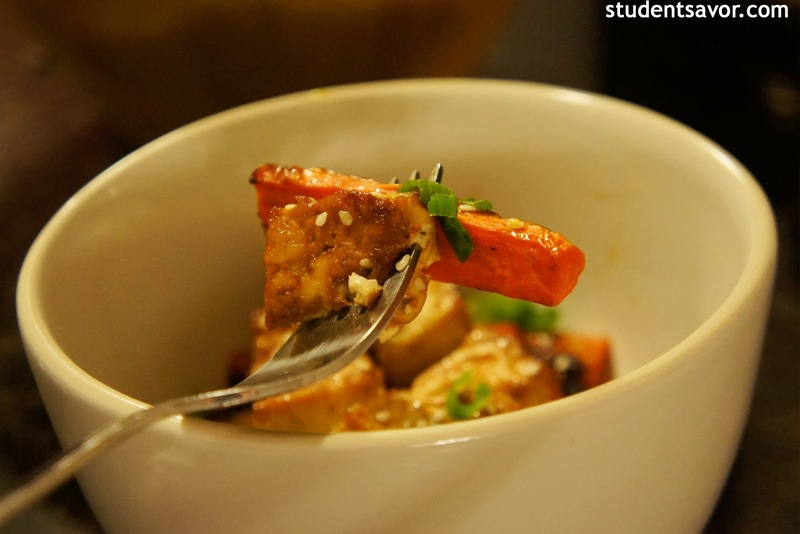 In a large bowl, whisk together oil, soy sauce and salt. Add carrots and toss to coat. Using a slotted spoon, transfer carrots onto baking sheet, reserving marinade, and push them to one side. Make sure carrots fit arranged in a single layer. 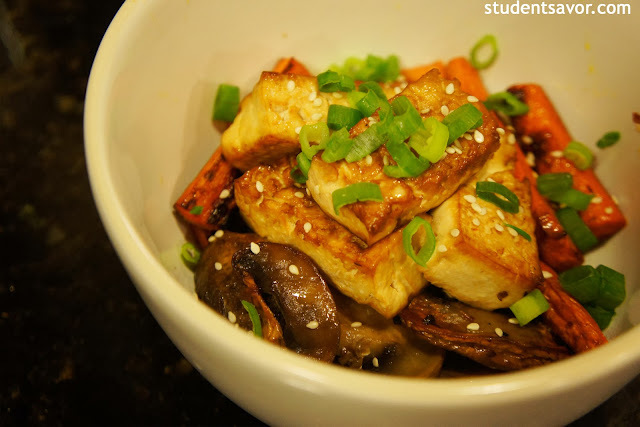 Slic tofu into 16 equal blocks and add a few pieces at a time to reserved marinade; toss gently to coat and transfer to sheet. Arrange tofu on a single layer. Reserve remaining marinade. 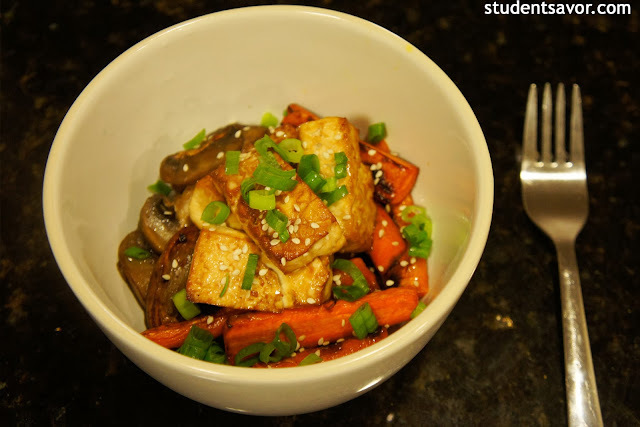 Broil until carrots are tender and tops are browned and tofu is golden, turning tofu half way and tossing carrots 3-4 times; about 30-35 minutes total. 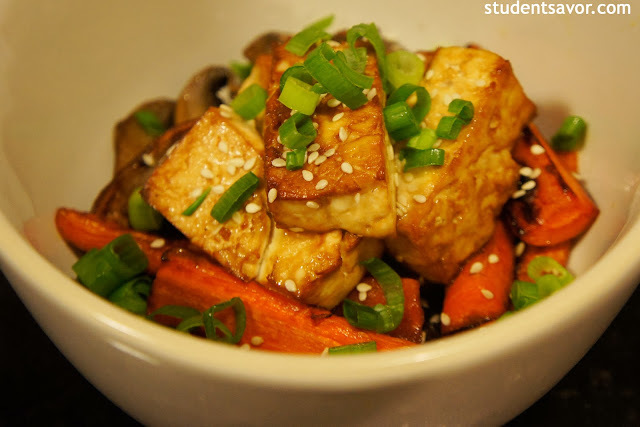 Transfer tofu and carrots to bowl with marinade; add scallions and vinegar and toss gently. Serve tofu and carrots topped with sesame seeds.